Last winter, heating costs rose dramatically across the country. The average American paid about $992 in heating costs over the winter, up 10.5% from the previous winter. With the cold weather starting to make its appearance already this fall, it’s time to start planning now for how you can cut your heating costs to save money without sacrificing comfort. Fortunately, there’s one simple step you can take that could reduce your heating expenses by as much as 10 percent. 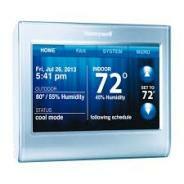 Installing a programmable thermostat will help reduce your heating bill. These days, you can pick up a good programmable thermostat for around $25. With a programmable thermostat, you’ll be able to set it to keep the temperature low during the day when you’re out of the house at work and at night when you’re asleep but warmer and cozier when you’re in the house awake. This ensures the heater is only being run when needed. According to the U.S. Department of Energy, knocking back the thermostat 10-15 degrees for 8 hours a day can save you 10% on your heating and cooling bill. That’s a nice amount of cash for such a small investment! Sanders & Johnson offers a full line of heating services to homeowners across the Denver area. For more information on our Denver heating and air services, Contact Us Today! Like us on FaceBook.